Italian Excursion – Brutti ma Buoni? Here’s a nice, no-neeed-to-plan ahead, mid/late afternoon weekend excursion – a trip to Washington Town Center, home of De Lorenzo’s Tomato Pies and Dolce & Clemente’s Italian Market. First we stop at Dolce & Clemente’s, for a little Italian grocery shopping, then we stow our goodies in the car before getting in line outside De Lorenzo’s – they open for dinner at 4:00pm, and the line starts forming about quarter-of. Moments after opening, the place is packed full. At Dolce & Clemente’s, right inside the door I spied a plastic “clamshell” package, with no labeling at all, of these messy looking…biscotti? Cookies? I’m not really sure, and didn’t ask, I just took them on instinct, thinking it would be fun to figure out what they were at home. They were cut like biscotti, only wider, and there were some curved pieces that made me think the dough, packed with almonds, was patted out free-form on a baking sheet, then hacked up after baking. I suspect it is made with egg whites (but is that an egg yolk wash on top? ), and also cinnamon, as the dough was tan-ish. There were little pockets of chewiness in the interior, maybe from almond paste, or just under cooking slightly, and the almond taste was quite pronounced. Those ingredients, at least the egg white and almond part of it, sound a lot like the northern Italian cookie known as “brutti ma buoni,” meaning “ugly but good.” I suppose it could be a similar recipe, but cooked into a different form. They are fantastic! For information on the colorful (of course!) 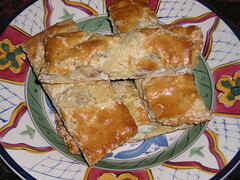 history of brutti ma buoni, and a recipe, visit this link, and read on. 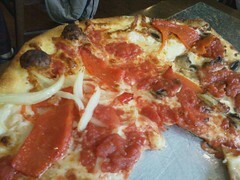 Then, on to De Lorenzo’s for their wonderful pizza. Big pieces of juicy roasted sweet red pepper, sweet onions (on half), mushrooms (on the other half), and extra garlic. Note that instead of tomato sauce, there are pieces of crushed tomato scattered about. And a very judicious use of cheese.